If you are an avid kayaker or you do own a kayak, two important things that you should know are how to transport a kayak during your excursion, and proper storage of kayak after usage. Now, much has been already written and said about adequately storing your kayak. Here we will focus on how to transport it effortlessly from your place to your favorite kayaking spot. First of all, the safest and easiest way to transport a kayak is with a dedicated roof rack and a kayak attachment. It’s simple, easy, and you know you will get your kayak home safely without a scratch. 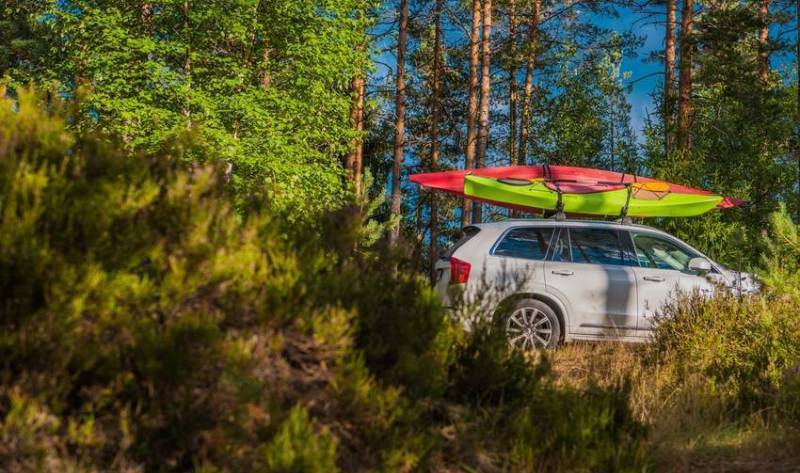 Here are some of the most common things that you should know about roof racks and kayaks. How Far Apart Should Roof Racks Be for a Kayak? Can You Transport a Kayak Upside Down? Can You Transport More Than One Kayak? How Many People Are Needed to Strap a Kayak on a Car Roof? Most kayak carriers come with a recommendation for at least 24 inches crossbar spread. However, based on the experience of many kayakers, the optimal spread is around 28 inches. An inch plus or an inch minus won’t make a big difference. But keep the spread within that range. Not only you can, but you should always transport a kayak upside down. That way the wind can press it to the roof rack instead of trying to blow it away from the roof. Yes, that’s possible, but it depends on the roof rack, how big are the kayaks, your vehicle, and other factors. 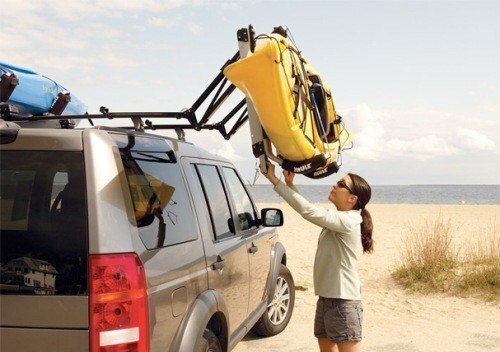 Most kayak roof racks can take two kayaks without any problem. One person can do it on its own. However, two is ideal as each person can hold one end of the kayak and there are almost zero risks of scratching the car. However, sometimes transporting your kayak on a roof rack is not possible. You may be short on cash, or maybe you need a temporary solution to get it home until your roof rack is delivered to you. In any case, you will need to find a solution that will get the job done the same as if you had a roof rack. Well, people are doing it, and there is a pretty simple hack that gets the job done. A 14-foot kayak can be transported without a roof rack and any problem. 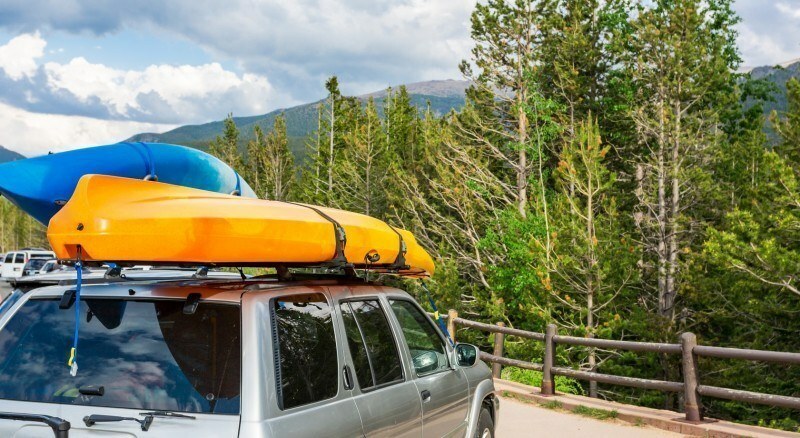 All you need is a few cheap supplies that can help you get the kayak on your car’s roof, secure it, and transport it to whatever destination. To transport a kayak without a roof rack, you will need a few pool noodles (at least three) and four ratchet straps. They are easy to obtain, and they are fairly cheap. 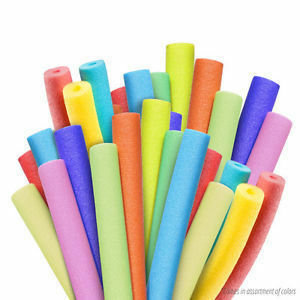 You need to ensure that you buy heavy-duty pool noodles as they are the best for the job. The heavy-duty pool noodles cannot be easily compressed, so they are perfect for protecting your car’s roof. Just don’t compress them too much, because it will potentially scratch your car. Grab the pool noodles and place them on the roof of the car. Place one near the back, one close to the front, and one in-between. You can place more if you have some extra laying around, but three are just enough to get the job done. If the noodles are wider than the width of the car, you can trim them. You can use a knife or scissors to do the job. Just be careful and don’t end up cutting yourself while trimming the pool noodles. Next, run the ratchet straps through the hole of each pool noodle. After you’ve done that, open the doors of the car and secure the ratchet straps around the inner side of your car’s roof. Make sure that you open the doors first. In case you forget to open the doors, you may find that you got the doors strapped to and they cannot be opened. If possible, ask someone to help you with this. If not, no need to worry, you can still do it on your own without scratching the car. You just need to be extra careful and make sure that you place it on top of the pool noodles. After you put the kayak on top of the noodles, make sure that the noodles are positioned as they should be. If needed readjust them so they are where they should be. The pool noodles should be 28 inches apart. Same as if they were roof racks. The kayak should be placed upside down, the same as if it was transported with standard roof racks. That way, it will be much more stable, and the wind will press the kayak toward the roof of the vehicle. Since you’ve used two ratchet straps, you got two straps left. Also, make sure that both your back and front doors are open. Place the one strap over the front-center part of the kayak so that both ends come out on the side of the vehicle. Then grab both ends and hook them together through the front doors. Repeat the process with the remaining strap, just this time at the back-center of the kayak and through the back doors. Don’t make the ratchet straps too tight because you can damage the hull of the kayak or the roof of the car. Double check everything to make sure the kayak is well secured. This is one of those things that is regularly overlooked by many people. Both the bow and the stern should always be tied down, especially if you are not using a roof kayak to transport them. Almost all cars come with built-in tow points underneath the front of the car. They are also known as towing eyes, and they are there in case your car needs towing. They can be used to attach the front straps. You can find similar tie-down spots on the back of your car. If you have a towbar, you can use that as well to attach the back straps. After a few miles stop and inspect the traps. Make sure that all is nice and tight, and the kayak hasn’t moved while you were driving. If needed make some adjustments. If not, let it stay there and keep on driving. Every time you stop for a break or a gas refill don’t forget to check if everything is okay and nothing is misplaced. They use worn out or damaged ratchet straps. Too many times this has caused the kayak to slip off the roof while the car is in motion. And when it slips, it is usually too late, and the kayak is heavily damaged. The ratchet straps are too tight. Some even put all their weight to keep the straps as tight as possible. As a result, they damage the kayak or the roof of the car. Sometimes even both. The trick here is to make the straps tight enough so that the kayak doesn't move. Driving in areas with low hanging trees and widespread branches doesn't only scratch your car, but can also scratch your kayak as well. The thing is that you don’t have to bring your car right to the water. Instead, park the car bit further from the water and carry the kayak on your own or with your partner. Pool noodles can get the job done, but only if they are the right one, heavy-duty. Any other type can damage both the car’s roof and the kayak. A roof rack is always the safest bet for transporting a kayak. But if you don’t want to spend that much, there is a safe alternative to that. All that you need is some heavy-duty pool noodles, four ratchet straps and a little bit of know-how.